Concord musician Brad Myrick lives a pretty busy life. When he isn’t managing operations at Strings & Things Music, he’s booking and promoting shows through his venture New Hampshire Music Collective. When he’s not doing that, he’s usually touring – here in the Granite State, in Italy, in India, in Chile. In between all that musical activity, he has also found time to hit the studio with his playing partner Nicola Cirpriani to record an album called Wanderlust. As its name implies, the album follows the theme of the hectic life of a professional musician, constantly traveling from one place to another. The album is a bare-bones display of exquisite guitar playing by both Myrick and Cipriani, the only two performers who appear on the instrumental record. This CD is two elite guitarists, sitting down with a couple acoustics, and showing what they can do. The album isn’t out yet – the Insider was lucky enough to be the first media outlet to get an early copy to listen to. The official release event will come on April 28 at Warner Town Hall. The guys will play cuts from the album at the 6:30 p.m. show, and, of course, copies of the album will be for sale. For those of you out there who can’t wait to learn about what’s on the album, you’re in luck. I had a few minutes last week to take in the whole album and write some notes on what I thought of it. Keep in mind, though, that I’ve never tried to review an instrumental album before. With no vocals, it’s a bit harder to describe one song compared to another, but I gave it my best effort. Also, you’ll notice that some tracks have names you’ll recognize, while others feature Italian words and/or names. The first track, “992 Hopkinton Road,” is very harmonic, symphonic even with the two guitars. 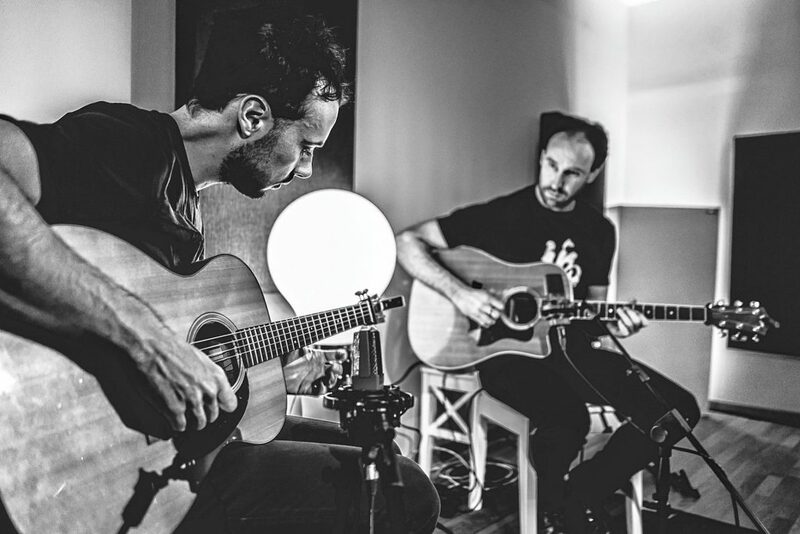 There’s a remarkably huge sound for just two acoustic guitars, and the chemistry between the two players is obvious immediately. The second track, “Renata,” is lighter, softer, more somber and more emotional. The sadness gives way to splashes of hope, with underlying tension riding in the background throughout. “Hopkinton Hoedown” is much faster, snappier, with heavier, harder chord strumming. In a minor key, this track is more intense than the previous ones. It does have a beat that fits with the hoedown theme. “Henniker Rain Song” is much slower and softer – a big come-down from the previous track. This has a sweet melody with softer picking on both guitars. “Everything Stands Still” is soft, mellow, reflective. A muted section really adds a different flow to song. “Distanze” has kind of a swingy beat, with a repeating riff that’s a little bluesy. This almost reminds me of the Joe Cocker version of “With a Little Help From My Friends” in the chorus section, and it really feels like a blues rock song. “Sur” features very active picking, going up and down the scale. Nice synchronization of the guitars throughout this gentler song. “Fidati Del Vento” is slower, sadder at first, then quickly kicks into a faster, more frantic gear. “Dimenticarsi” has a slow major scale piece to open. The energy picks up as it goes, for both guitars, before settling back down. The last track, “Kearsarge,” features medium-paced picking on the lead, with a cool pull-off section that repeats a few times throughout the song. It’s a nice ending to the CD. The bottom line is if you want to hear crisp, clear, precise, harmonic – and, at times, insanely fast – guitar playing, you have to listen to Wanderlust.